There are films where the music doesn’t quite match up to the plot and acting then there are films where the music is really the only reason you’re likely to watch the film. To be honest Bikinis y rock falls into the latter category but the music really is quite something and we firmly believe you will dig this – if you don’t then we’re clearly barking up the wrong tree. 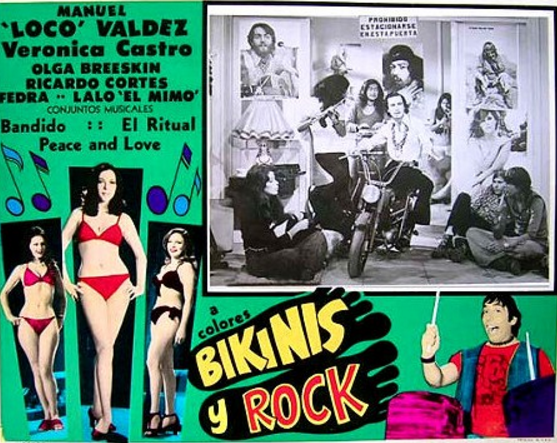 Having done literally minutes of research we can’t find a huge amount about Bikinis y rock on the world wide web except to say it is a 1972 remake of the 1964 Mexican film A ritmo de twist (translated as A Rate of Twist). It seems the plot line revolves around a teenager whose only interest in life appears to be rock’n’roll music and his uncle is concerned about this. So concerned in fact that he decides to give the young fella some responsibility and puts him in charge of his business selling swimsuits. Cue lots of young ladies in bikinis, lots of dancing and fortunately for us lots of great music. As you can well imagine Bikinis y rock (Bikinis and Rock) doesn’t vary hugely from its older brother. We’ll not show the whole movie but instead we’ve selected our favourite musical clips which we hope you’ll heartily enjoy. If you want to seek out the movie then we wish you luck but if you locate a copy give us a shout and we’ll add it to the collection.